1. 165 hp Bulldozer (165 hp dozer) has attractive appearance and a strong sense of the times. 4. Three components on single element single stage torque converter, high efficiency, large capacity. 5. The new-style ROPS-FOPS, practical, beautiful. 6. The novel hexagon cabin, a broader vision, better ventilation, better seal effect. 7. 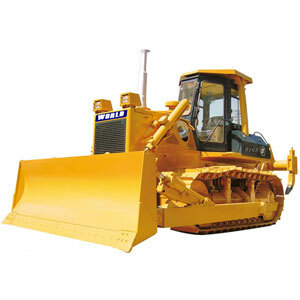 165 hp Bulldozer the new-style bulldozing working equipment is durable and its bucket capacity is much larger. 8. The new-style three-stage alarm device is mechanically integrated, electronic monitoring instrument shows three-stage alarm. 9. Manipulation design is people-oriented. Handle distributes both sides, which makes it more convenient to operate. 10. Working equipment adopts servo controlling, less strength to operate. 11. Working equipment adopts electronic lock, more convenient, more reliable. 12. Diverse optional devices: ROPS-FOPS cabin, ordinary cabin, cabin with air conditioner, heater, the anther starting aid, angle and straight blade push broach, U-blade spade, environmental sanitation spade etc. 165 hp Crawler bulldozer we produce has been exported to Europe, South America, Middle East, Southeast Asia, and Africa. 165 hp Bulldozer (165 hp dozer) is very popular in these countries. Over 10 years of export experience, World Equipment has become a leading Chinese manufacturer of crawler bulldozer. We also keep developing and researching 165 hp bulldozer (165 hp dozer) products better adapted to the market to gain more acknowledgements from the clients. If you need 165 hp bulldozer (165 hp dozer), please contact us. 220 hp Bulldozer (220 hp dozer) has reasonable structure, advanced performance, advanced technology.